One of the UK's leading sitarists, he has performed throughout the UK, India, Europe and America. As a student of the worlds top sitarist (Ustad Shahid Parvez) his approach to classical and folk music is progressive and thoughtful. Beautiful melodies and showmanship are present at all of his events. He has been interviewed and recorded for film and television, and has worked with a number of fusion, theatre and dance groups. 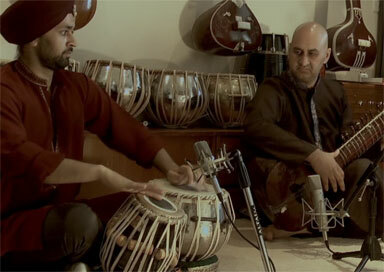 He also accompanies as a tabla player for various artists. He can also be booked with his wife who is a singer from Punjab, India and has an M.A. in vocal music. She has studied with Pandit Om Parkash and Pashupati Nath Mishra and has performed in India and the UK and has featured on a number of recordings. She is skilled in folk, classical, popular and religious singing styles and is blessed with a stunning voice. Whist singing she also plays tanpura (a stringed drone instrument) or harmonium (a wind powered keyboard). Also available for Ladies Sangeet events. “a very melodious person who we must listen to again…..” Rajan Mishra (legendary Khayal Vocalist). "a stunner.......a work of exquisite beauty" Bobby Friction (BBC Radio 1, BBC Asian Network). "Well done, I really enjoyed your music" Satish Vyas (world renowned Sanoor player).